For many modelers, the first challenge we all faced was how to get the parts off the part trees (sprues) with as little damage as possible. As kids most of us used knives, toenail clippers or wire cutters with varying degrees of success. But as we matured we found out often they could either cause as much damage as they prevented or even let the parts fly off to be eaten by the carpet monster. So most of us bought special sprue cutters. These were okay for big parts – they came as either wire-cutter style with moving handles or tweezer style with a toenail-cutter shaped face - but with smaller and smaller parts they found their limitations. They also did not do a great job on etched brass parts, as they tended to bend or deform the parts in the process of removal. Medical quality stainless steel shears worked well enough but were large and awkward for use on some parts. 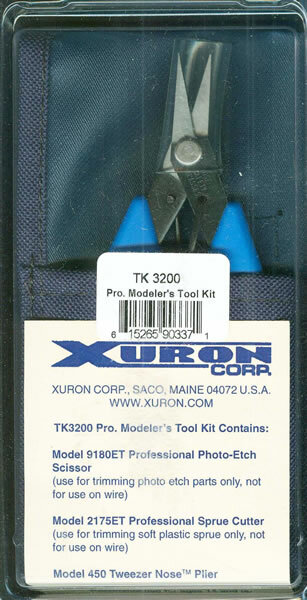 I have used Xuron cutters for a number of years now, and the great advantage they had over some other brands was the fact they were spring-loaded to make them more precise and more comfortable in the hand. I had seen the “upmarket” sets for a while but it was not until I got a good look at them at the 2015 IPMS National Convention that I picked up this set. The set comes in a nylon holster for protection and includes a sprue cutter, photo-etch shear, and a “Tweezer Nose” needle nose plier. The sprue cutter comes with long thin bladed jaws and provides for a shearing action that removes the “bump” left by most cutters. The older ones I have tend to leave such a bump so I will be happy to make the switch and save the other one for jobs not recommended here such as brass wire and aluminum parts. The photo-etch shear has an even longer and thinner set of jaws that cut with as little as 1 mm of space available - about par for most etched brass frets - and is less likely to bend or damage the brass. The plier has a smooth set of jaws that go down to a tip width of about 2mm and can be used to both form and install etched brass parts. I have had problems with regular tweezers with some parts so this looks to be the answer. While these parts seem pricey they DO last nearly forever if not misused (the handy guide indicates that the sprue cutters are for sprue and the shears for etched brass; other specific shears are recommended for wire, model railroad track and other purposes) and I for one tend to agree. Overall this is a handy set and is worth the money due to the precision and endurance they offer.